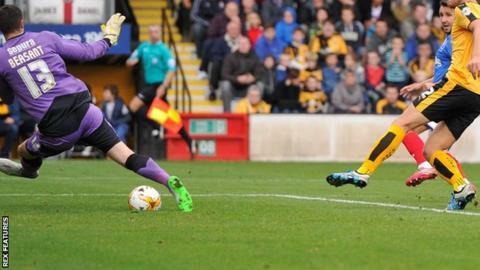 Portsmouth came from behind to maintain their unbeaten away record with victory in an eventful game at Cambridge. Robbie Simpson gave the hosts a controversial lead as he raced through. Cambridge's Mark Roberts was sent off for violent conduct at half-time and Pompey equalised through Leon Legge's own goal after the interval. Matt Tubbs finished a Gareth Evans cross for the lead and headed a second to seal a win slightly marred by an injury-time red card for Gareth Evans. Evans was sent off for a foul on Elliot Omozusi, but the late dismissal did not prevent Paul Cook's side going temporarily joint top of League Two on goal difference. Neither did the confusing nature of Cambridge's goal. An offside flag was raised as Simpson latched on to Luke Berry's pass behind the visiting defence and Portsmouth's players stopped in their tracks. Simpson carried on to round goalkeeper Aaron McCarey and score and, despite protests, referee Seb Stockbridge let the goal stand and overruled the assistant's decision. Cambridge's Roberts was sent off as tempers frayed again among the players as they made their way to the tunnel for the interval. He clashed with McCarey and Portsmouth assistant manager Leam Richardson. Portsmouth eventually made the man advantage count as Tubbs's shot was deflected past Sam Beasant via Legge's attempted clearance. Within 120 seconds, the former Bournemouth striker had a goal of his own and his second in as many games. His low right-foot shot rifled past Beasant and then he was in the right place to head in to a vacant net in the closing moments, netting on the rebound after Kal Naismith hit the bar, to make the points safe. "It was a good test for us at half-time, because a patient passing game that we can usually be criticised for certainly worked well today. "Our ball retention in the second half moved them about really well. We got deeper and deeper and then we were able to score goals by putting quality in the box. "(Cambridge's goal) was offside, the linesman flagged for offside and then we get told the referee said it came off us. "We watched it again, Berry passes forward for his player, and he's offside. Listen, whether good or bad, the referees make decisions. I'll never criticise them, if we got beat 1-0 today I would say the same thing." Match ends, Cambridge United 1, Portsmouth 3. Second Half ends, Cambridge United 1, Portsmouth 3. Gareth Evans (Portsmouth) is shown the red card. Elliot Omozusi (Cambridge United) wins a free kick in the attacking half. Foul by Gearoid Morrissey (Cambridge United). Elliot Omozusi (Cambridge United) wins a free kick in the defensive half. Substitution, Portsmouth. Nigel Atangana replaces Adam Barton. Goal! Cambridge United 1, Portsmouth 3. Matt Tubbs (Portsmouth) header from very close range to the top right corner. Kal Naismith (Portsmouth) wins a free kick on the left wing. Corner, Portsmouth. Conceded by George Taft. Substitution, Cambridge United. Gearoid Morrissey replaces Harrison Dunk. Adam Barton (Portsmouth) wins a free kick in the defensive half. Foul by Jeff Hughes (Cambridge United). Jeff Hughes (Cambridge United) is shown the yellow card for a bad foul. Corner, Portsmouth. Conceded by Elliot Omozusi. Attempt missed. Gary Roberts (Portsmouth) right footed shot from outside the box is too high from a direct free kick. Gary Roberts (Portsmouth) wins a free kick in the attacking half. Goal! Cambridge United 1, Portsmouth 2. Matt Tubbs (Portsmouth) right footed shot from the centre of the box to the centre of the goal. Assisted by Gary Roberts. Goal! Cambridge United 1, Portsmouth 1. Matt Tubbs (Portsmouth) right footed shot from the centre of the box to the top left corner. Substitution, Portsmouth. Adam Webster replaces Matthew Clarke. Corner, Portsmouth. Conceded by Sam Beasant. Attempt saved. Kyle Bennett (Portsmouth) left footed shot from outside the box is saved in the bottom right corner.